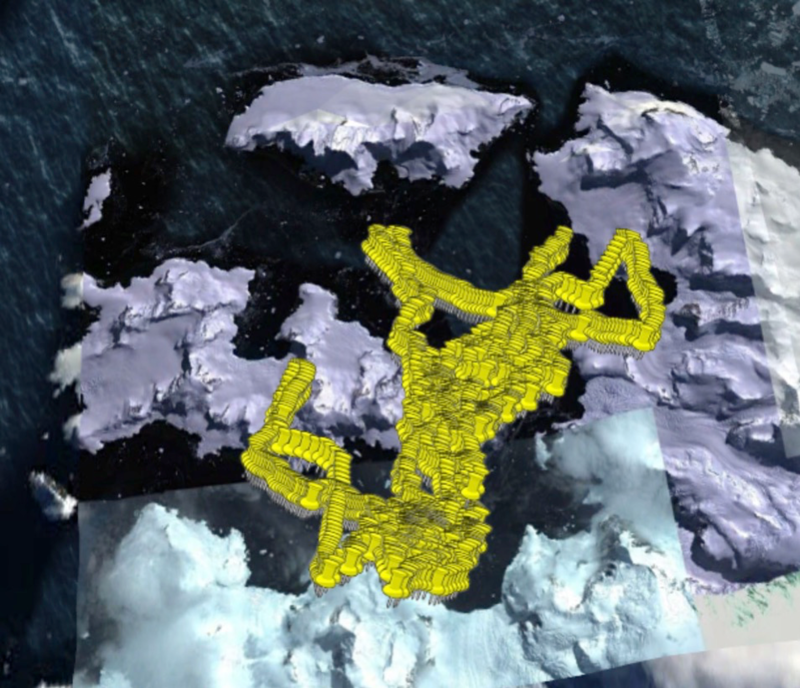 The Antarctic Peninsula is warming rapidly and one of the consequences of this change is a decrease in sea ice cover. 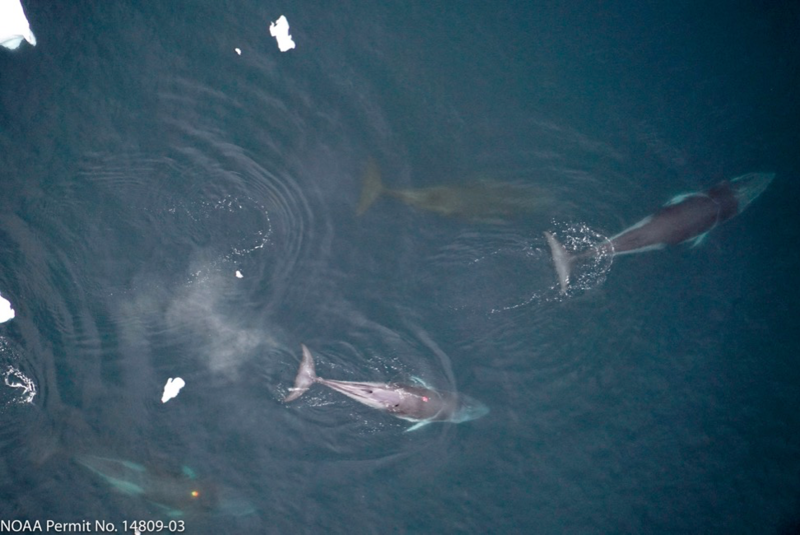 Antarctic minke whales are the largest ice-obligate krill predator in the region yet little is known about their foraging behavior and ecology. 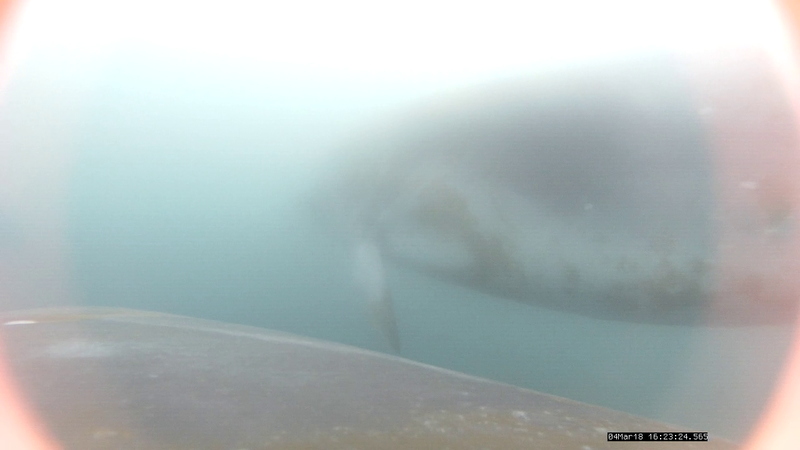 The goals of our research project are to use suite of new technological tools to measure the underwater behavior of the whales and better understand how they exploit the sea ice habitat. 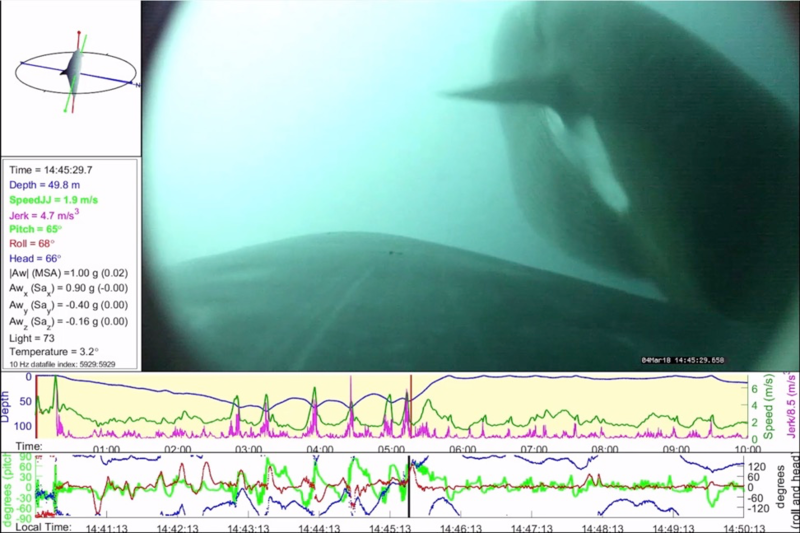 Using video-recording motion-sensing tags, we can reconstruct the underwater movements of the whales and determine where and when they feed. 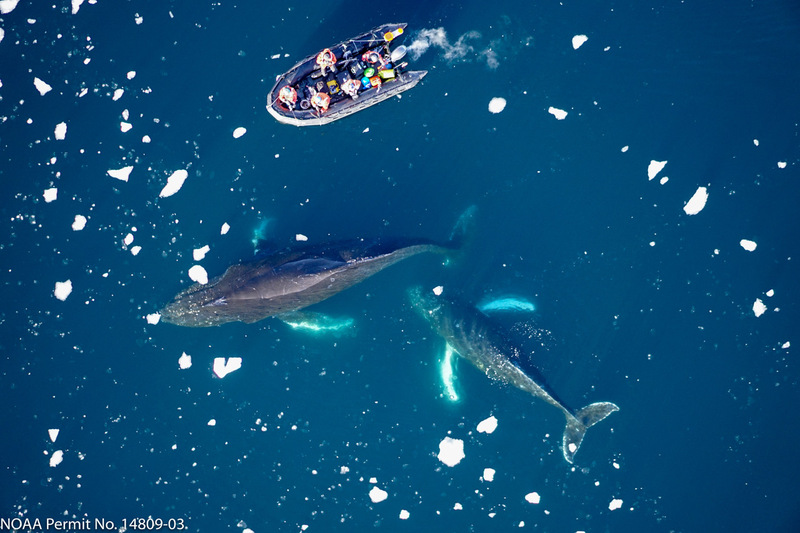 Using UAS (unmanned aerial systems) we can generate real-time images of sea ice cover and link these with our tag data to determine how much time whales spend in sea ice versus open water, and how the behavior of the whales changes between these two habitats. 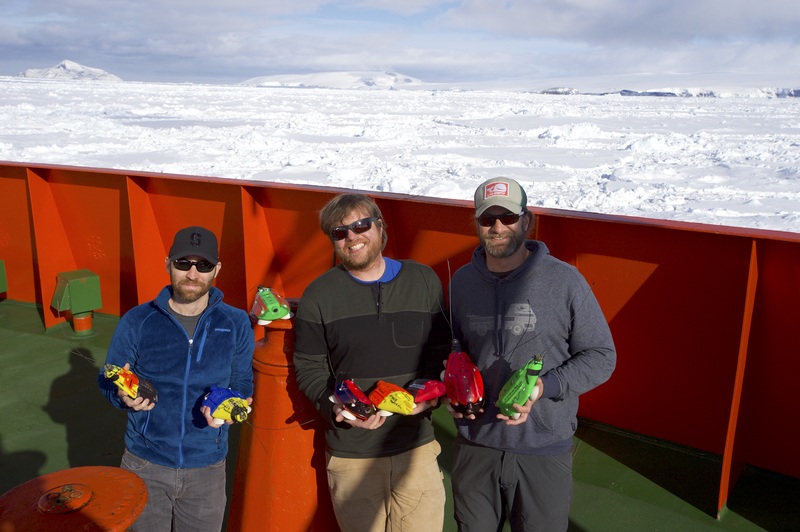 Lastly, we will use scientific echosounders to characterize the prey field that the whales are exploiting and look for differences in krill availability inside and out of the ice. 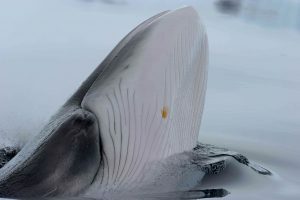 All of this information is critical to understand the ecological role of Antarctic minke whales so that we can better predict and understand the impacts of climate change not only on these animals, but on the structure and function of the Antarctic marine ecosystem. Our research will promote the progress of science by elucidating the ecological role of a poorly known Antarctic predator and using this information to better understand the impact of climate change in polar regions. The integration of our multi-disciplinary methods to study marine ecology and climate change impacts will serve as a template for similar work in other at-risk regions and species. 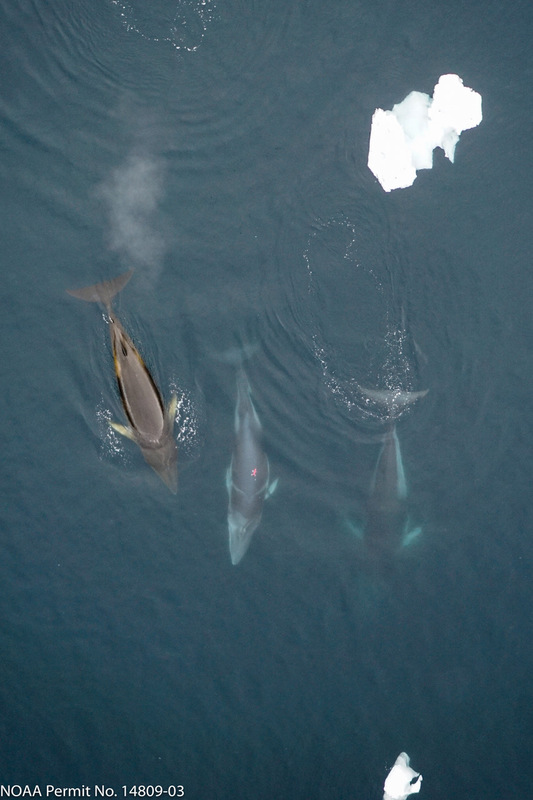 Our educational and outreach program will increase awareness and understanding of minke whales, Antarctic marine ecosystems, sea ice, and climate change through the use of documentary filming, real-time delivery of project events via social media, and Scientific Research and Education Network curriculum development for formal STEM educators. 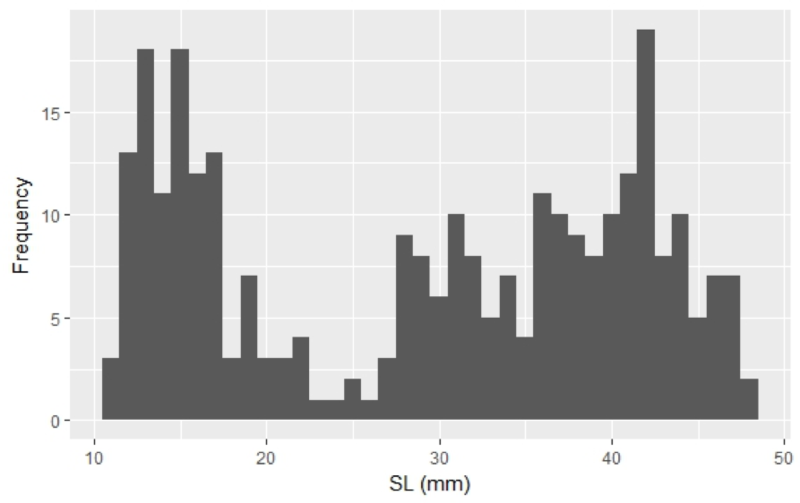 What is the feeding performance of AMWs? 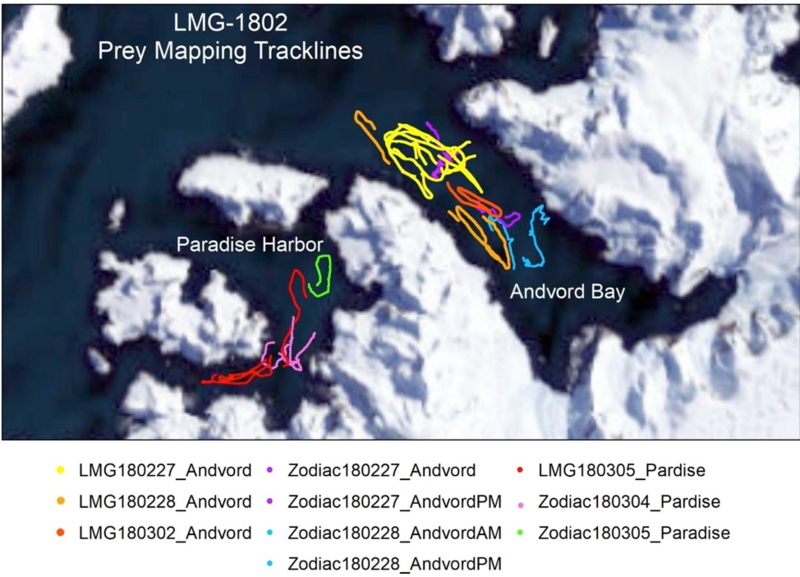 How important is sea ice to the foraging behavior of AMW? 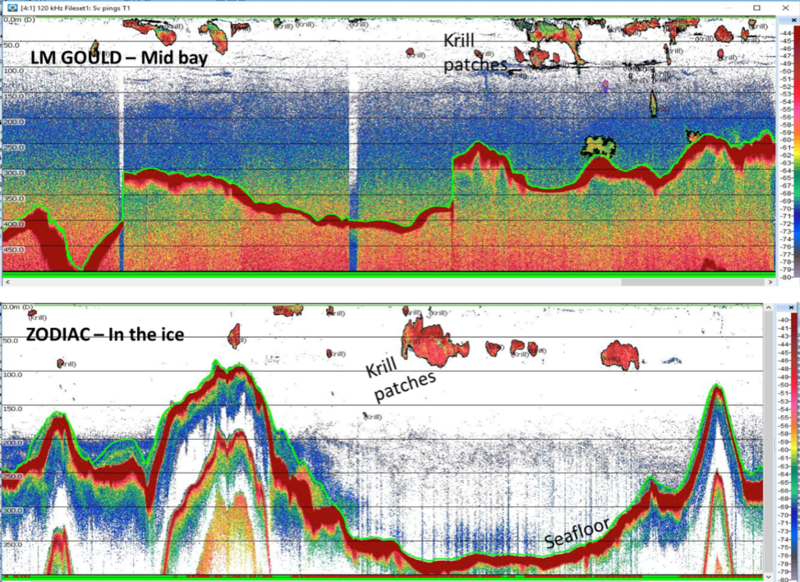 How do AMWs feed directly under sea ice? We will use proven tagging and analytical approaches to characterize the underwater feeding behavior and kinematics of minke whales. 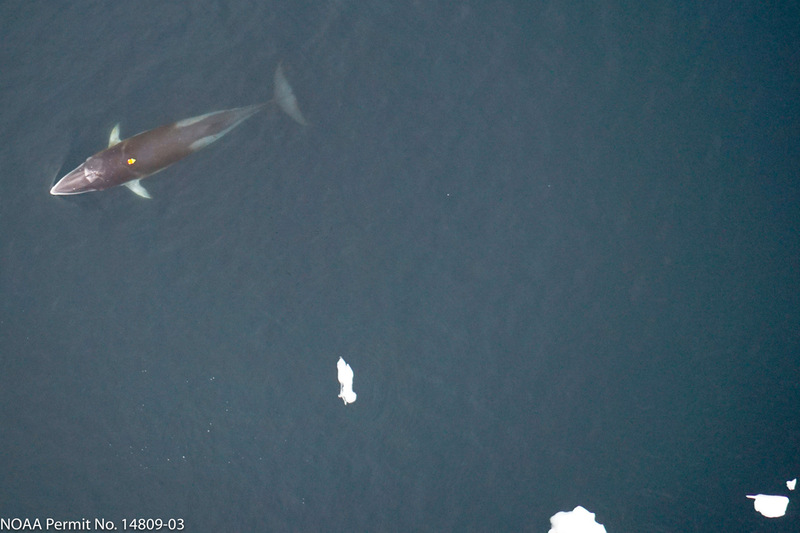 Combined with quantitative measurements of the prey field, we will measure the energetic costs of feeding and determine how minke whales optimize energy gain. 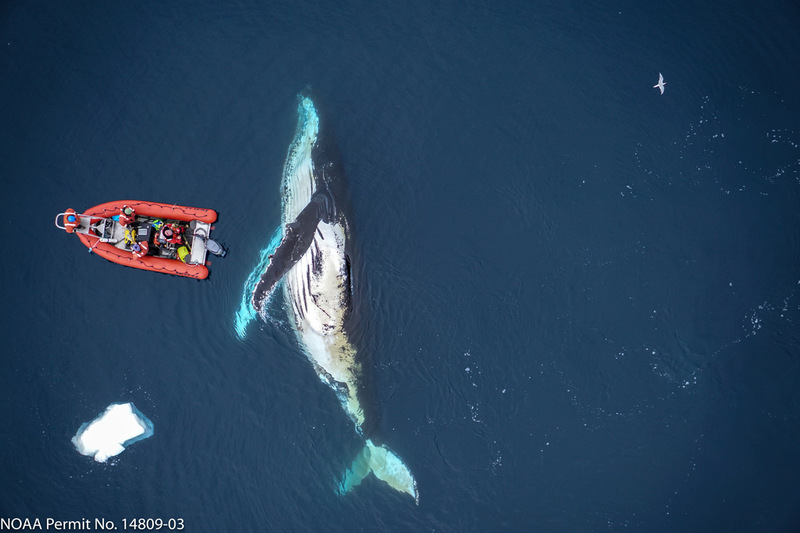 Using animal-borne video recording tags and UAS technology we will also determine how much feeding occurs directly under sea ice and how this mode differs from open water feeding. 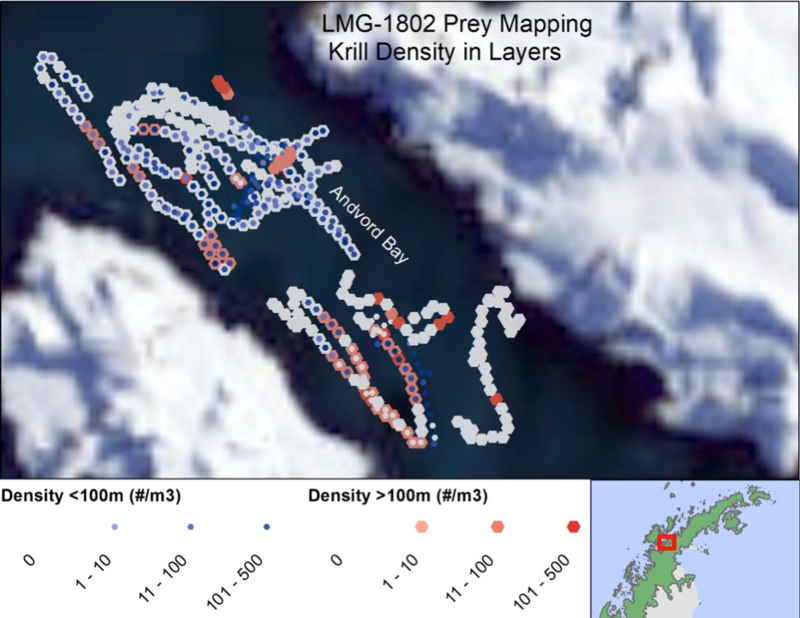 This knowledge will: (1) significantly enhance our knowledge of the least-studied Antarctic krill predator; and (2) be made directly available to international, long-term efforts to understand how climate-driven changes will affect the structure and function of the Antarctic marine ecosystem. Our educational and outreach are to increase awareness and understanding of: (i) the ecological role of minke whales around the Antarctic Peninsula; (ii) the effects of global climate change on an abundant but largely unstudied marine predator; (iii) the advanced methods and technologies used by whale researchers to study these cryptic animals and their prey; and (iv) the variety of careers in ocean science by sharing the experiences of scientists and students. These will be achieved by delivering continuous near-real-time delivery of project events and data to informal audiences through pervasive social media channels, together with a traditional professional development program that will provide formal STEM educators with specific standards-compliant lesson plans. These traditional products will be delivered through the established Scientific Research and Education Network (SCiREN) program. Our daily activities have consisted of working from small boats during morning hours to search for whales to tag and/or to recover tags deployed previously. During this time the LMG conducts prey mapping surveys and/or CTD/net tows for environmental sampling. Afternoons have been similar with continued tagging efforts and prey mapping. A recent article on our fieldwork this season was published here. 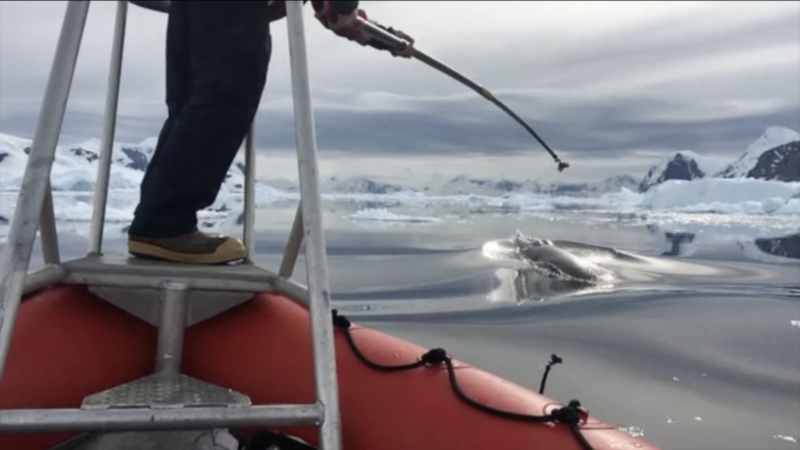 In total during the seven days of tagging efforts, suction cup tags were deployed on 20 animals (9 minke whales, 10 humpback whales and 1 killer whale). 18 of the 20 tags were recovered. 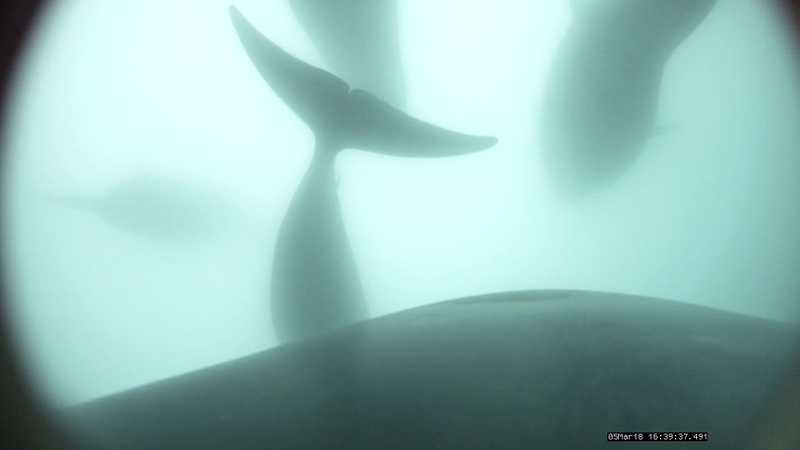 A total of 293 hours and 47 minutes (minke: 125h 57m, humpback: 166h 55m, killer: 1h 57m) of animal behavior and spatial orientation were logged in three dimensions at high resolution (50-400 Hz), and approximately 90 hours of on-animal video data were collected. Two of the tagged minkes and eight of the tagged humpbacks had corresponding UAV imagery that will allow body lengths to be accurately determined. 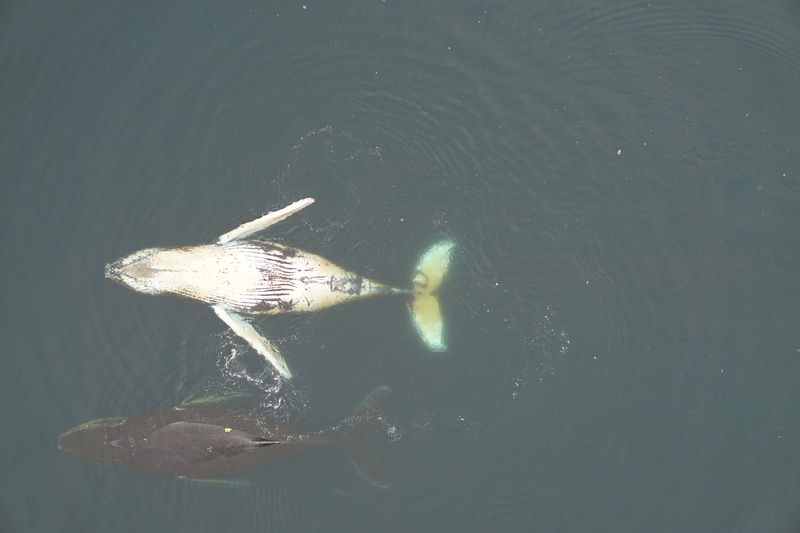 We flew a LEMHex-44 hexacopter UAS (unmanned aerial system, or drone) fitted with a 20mp RGB camera to collect remote imagery of whales and their habitat. Flights were conducted from both the Zodiac and Solas small boat platforms, launched and recovered by hand. The duration of flights ranged from 9 to 13 minutes with a total flight time of 2 hr 44 min 17 sec. 15 humpback whales were photographed for morphometric purposes, including 3 mother/juvenile pairs and two animals fitted with Limpet Satellite-linked time depth recorders. 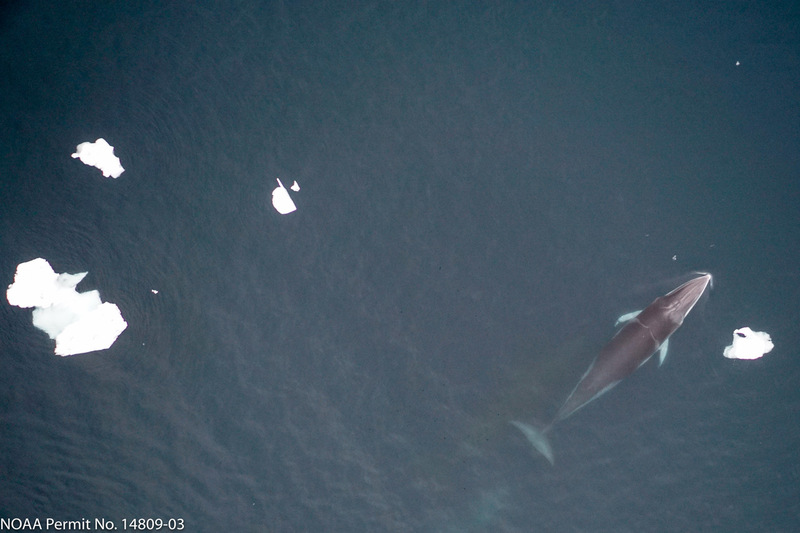 14 minke whales were photographed for morphometric purposes, including 2 animals that were fitted with CATS motion and video tags. Prey mapping, primarily targeting krill, is conducted on two platforms: a towfish towed from the ARSV Laurence M Gould and a pole mount on a 12ft Zodiac. We surveyed over 180 kilometers in Andvord Bay and Paradise Harbor. 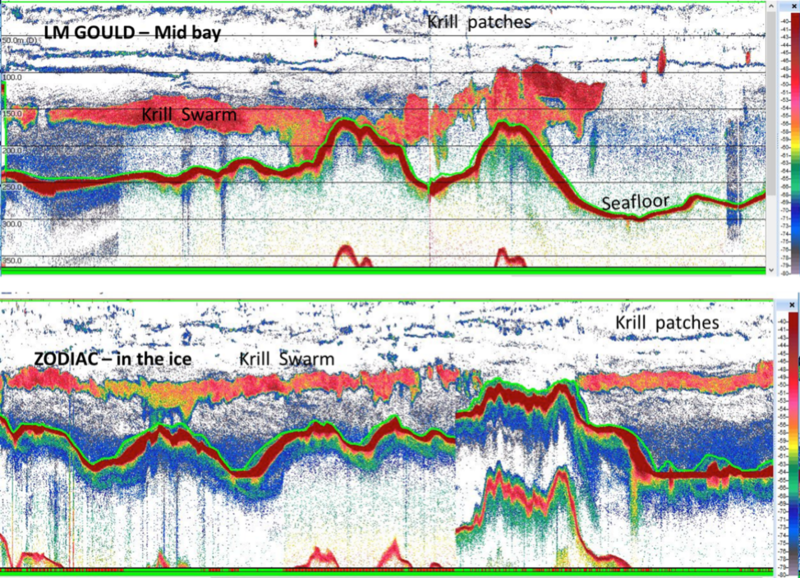 In Andvord Bay, the krill patches were highly variable in size and shape, but most were within 100m of the surface. 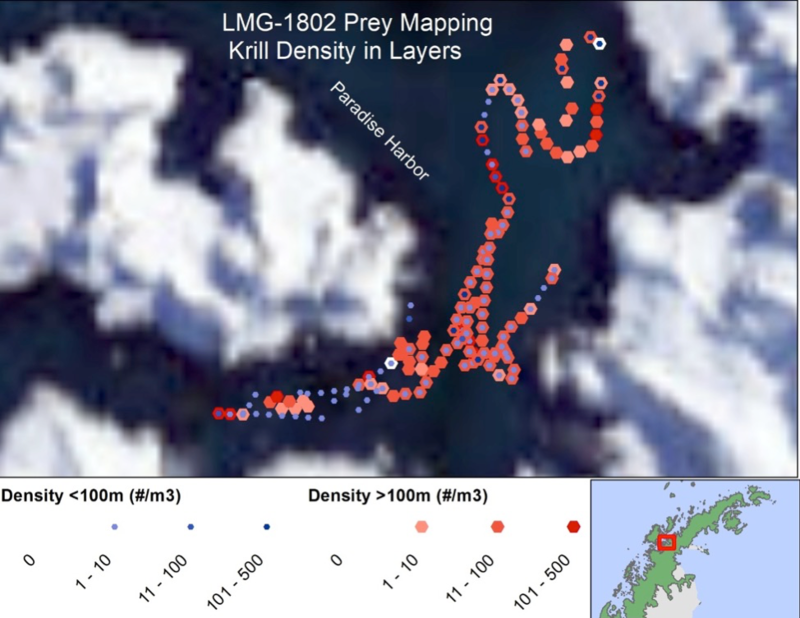 In Paradise Harbor krill distribution varied from small and sparsely distributed patches in the upper 100m to very large and nearly continuous swarms between 100 and 200m depths. 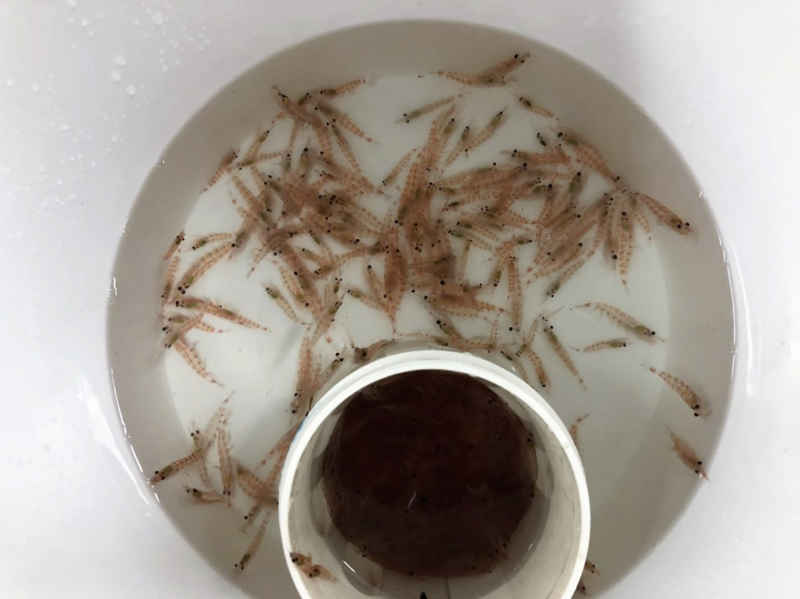 One krill net tow was conducted on 2 March in Andvord Bay and two were conducted on 6 March in Paradise Harbor to ground truth sizes and acoustic target strengths and calibrate the estimates of krill biomass. About 100 krill were measured for length from each tow and 11 were subsampled and frozen for gut fluorescence.